Sodium  is a chemical element with symbol Na (from New Latin natrium) and atomic number 11. It is a soft, silver-white, highly reactive metal. In the Periodic table it is in column 1 (alkali metals), and shares with the other six elements in that column that it has a single electron in its outer shell, which it readily donates, creating a positively charged atom - a cation. Its only stable isotope is 23Na. The free metal does not occur in nature, but instead must be prepared from its compounds. 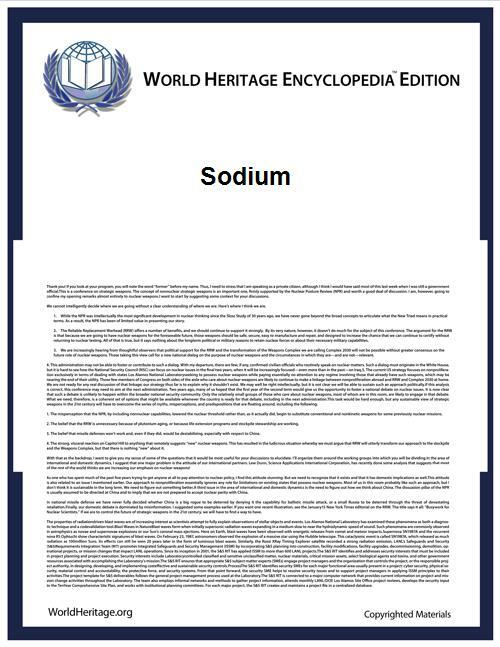 Sodium is the sixth most abundant element in the Earth's crust, and exists in numerous minerals such as feldspars, sodalite and rock salt (NaCl). Many salts of sodium are highly water-soluble: sodium ions have been leached by the action of water from the earth's minerals over eons, so that sodium (and chlorine) are the most common dissolved elements by weight in the oceans. Sodium was first isolated by Humphry Davy in 1807 by the electrolysis of sodium hydroxide. Many sodium compounds are useful, such as sodium hydroxide (lye) for soap-making and sodium chloride for use as a de-icing agent and a nutrient (edible salt). Sodium is an essential element for all animals and some plants. Sodium ions are the major cation in the extracellular fluid (ECF) and as such are the major contributor to the ECF osmotic pressure, and thus ECF compartment volume. Loss of only water from the ECF compartment increases the sodium concentration: hypernatremia. Isotonic loss of water and sodium from the ECF compartment decreases the size of that compartment: ECF hypovolemia. Sodium ions are pumped out of cells by Na+/K+-ATPase in exchange for potassium. It pumps three sodium ions out of the cell for every two potassium ions pumped in, contributing to the fact that about forty times as much potassium is inside cells compared to outside, and about ten times as much sodium is outside cells compared to inside. In nerve cells, a buildup of electrical charge across the cell membrane allows transmission of a nerve impulse - an action potential - when the charge is dissipated. Sodium at standard temperature and pressure is a soft silvery metal that oxidizes to grayish white unless immersed in oil or inert gas. Sodium can be readily cut with a knife and is a good conductor of electricity and heat. These properties change dramatically at elevated pressures: at 1.5 Mbar, the color changes from silvery metallic to black; at 1.9 Mbar the material becomes transparent with a red color; and at 3 Mbar sodium is a clear and transparent solid. All of these high-pressure allotropes are insulators and electrides. When sodium or its compounds are introduced into a flame, they turn it yellow, because the excited 3s electrons of sodium emit a photon when they fall from 3p to 3s; the wavelength of this photon corresponds to the D line at 589.3 nm. Spin-orbit interactions involving the electron in the 3p orbital split the D line into two; hyperfine structures involving both orbitals cause many more lines. Emission spectrum for sodium, showing the D line. 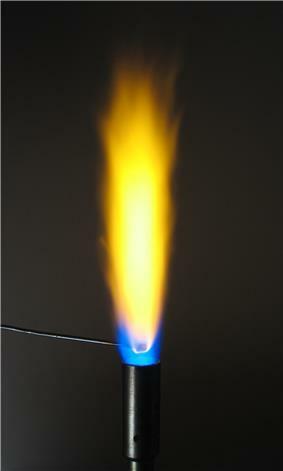 A positive flame test for sodium has a bright yellow color. When freshly cut, sodium has a bright, silvery luster. If exposed to air, the surface rapidly tarnishes, darkening at first and then forming a white coating of sodium hydroxide and sodium carbonate. Sodium is generally less reactive than potassium and more reactive than lithium. Like all the alkali metals, it reacts exothermically with water, to the point that sufficiently large pieces melt to a sphere and may explode; this reaction produces caustic soda (sodium hydroxide) and flammable hydrogen gas. When burned in dry air, it mainly forms sodium peroxide as well as some sodium oxide. In moist air, sodium hydroxide results. Sodium metal is highly reducing, with the reduction of sodium ions requiring −2.71 volts. Hence, the extraction of sodium metal from its compounds (such as with sodium chloride) uses a significant amount of energy. However, potassium and lithium have even more negative potentials. Twenty isotopes of sodium are known, but only 23Na is stable. Two radioactive, cosmogenic isotopes are the byproduct of cosmic ray spallation: 22Na with a half-life of 2.6 years and 24Na with a half-life of 15 hours; all other isotopes have a half-life of less than one minute. Two nuclear isomers have been discovered, the longer-lived one being 24mNa with a half-life of around 20.2 microseconds. Acute neutron radiation, such as from a nuclear criticality accident, converts some of the stable 23Na in human blood to 24Na; by measuring the concentration of 24Na in relation to 23Na, the neutron radiation dosage of the victim can be calculated. 23Na is created in the carbon-burning process in stars by fusing two carbon atoms together; this requires temperatures above 600 megakelvins and a star of at least three solar masses. The Earth's crust contains 2.6% sodium by weight, making it the sixth most abundant element on Earth. Because of its high reactivity, it is never found as a pure element. It is found in many different minerals, some very soluble, such as halite and natron, others much less soluble such as amphibole, and zeolite. The insolubility of certain sodium minerals such as cryolite and feldspar arises from their polymeric anions, which in the case of feldspar is a polysilicate. In the interstellar medium, sodium is identified by the D spectral line; though it has a high vaporization temperature, its abundance allowed it to be detected by Mariner 10 in Mercury's atmosphere. Sodium has been detected in at least one comet; astronomers observing Comet Hale-Bopp in 1997 observed a sodium tail, which consisted of neutral atoms (not ions) and extended to some 50 million kilometres in length. 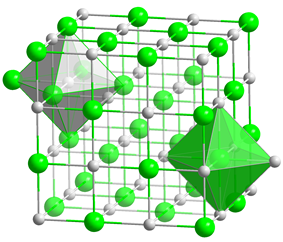 Structure of sodium chloride, showing octahedral coordination around Na+ and Cl− centres. This framework disintegrates upon dissolution in water and reassembles upon evaporation. Sodium compounds are of immense commercial importance, being particularly central to industries producing glass, paper, soap, and textiles. The sodium compounds that are the most important include table salt (NaCl), soda ash (Na2CO3), baking soda (NaHCO3), caustic soda (NaOH), sodium nitrate (NaNO3), di- and tri-sodium phosphates, sodium thiosulfate (Na2S2O3·5H2O), and borax (Na2B4O7·10H2O). In its compounds, sodium is usually ionically bonded to water and anions, and is viewed as a hard Lewis acid. Two equivalent images of the chemical structure of sodium stearate, a typical soap. Sodium tends to form water-soluble compounds, such as halides, sulfates, nitrates, carboxylates and carbonates. The main aqueous species are the aquo complexes [Na(H2O)n]+, where n = 4–6. The high affinity of sodium for oxygen-based ligands is the basis of crown ethers; macrolide antibiotics, which interfere with Na+ transport in the infecting organism, are functionally related and more complex.